Thousands of employees of the National Weather Service are currently working through the US government shutdown, but don't know when they're getting paid. 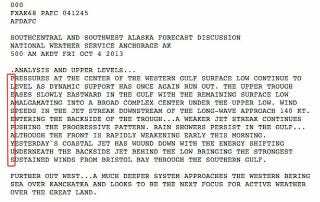 And someone from the Anchorage office has expressed their displeasure in a secret message hidden in the forecast discussion. The Washington Post points out that there are currently two versions of this forecast discussion on the National Weather Service website, one with the acrostic message and one without it. Some 3,935 employees of the NWS have been excepted from the government shutdown, but there is currently no money to pay them.